Diama-Shield's Surface Prep Division performs: (1) VCT and ceramic tile removal; (2) mastic, adhesive and thin-set removal; (3) epoxy, paint and floor coating removal; (4) grime, grease and manufacturing by-product deep cleaning and remediation; (5) coatings prep, etching and profiling for improved adhesion; (6) milling, leveling and ridgeline removal and (7) bulk concrete removal projects. As a turn-key flooring contractor, Diama-Shield is able to quickly and efficiently perform surface prep tasks prior to completing floor finishing scopes of work resulting in greater value for its customers. Flooring improvements often begin with removing old, damaged and unwanted floor coverings. 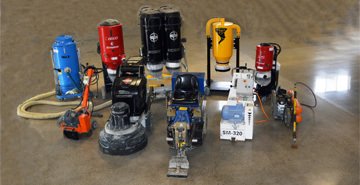 VCT, ceramic tile, mastic and thin-set removal requires specialized equipment and expertise. 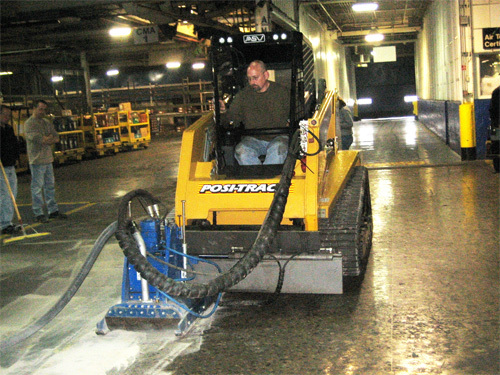 Diama-Shield utilizes ride-on and pneumatic tile removers to perform bulk removal. Extensive experience allows Diama-Shield to develop a work plan utilizing the most efficient equipment outfitted with the most productive tooling to tackle even the most complicated coating removal project. Extreme circumstances can call for extreme measures. When projects require floor milling, surface leveling and bulk concrete removal, Diama-Shield's experience and specialized equipment allow it to tackle the most extreme concrete removal projects. Flooring improvements often begin with removing old, damaged and unwanted floor coverings. 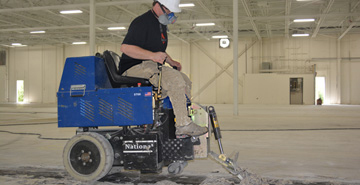 VCT, ceramic tile, mastic and thin-set removal requires specialized equipment and expertise. Diama-Shield's tile and adhesive removal processes utilize ride-on and pneumatic tile removers to perform bulk removal. Hand scrapers and power tools are used to perform detail work. An array of grinders, scarrifiers, milling machines and diamond brushes are routinely deployed to aggressively remove any remaining mastic, adhesive or thin-set. Diama-Shield is able to avoid the use of harsh floor strippers, dangerous VOCs and harmful solvents by relying on mechanical removal techniques rather than chemical based systems. Not only are Diama-Shield's removal processes more environmentally responsible, they eliminate the need to shut down facilities due to dangerous fumes and offensive odors. 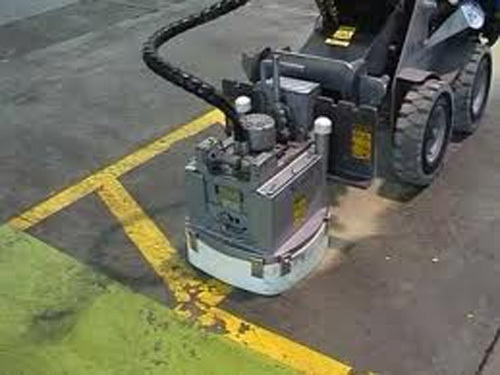 Industrial grade vacuums are used to control, capture and eliminate dust and debris. As concrete polishing professionals, Diama-Shield understands the importance of removing tile, mastic and thinset carefully to avoid damaging underlying surfaces. Even though it can be a dirty and difficult job, Diama-Shield takes great pride in properly preparing floors to receive finishes. Diama-Shield's professionalism, craftsmanship and understanding set it apart from demolition style mastic removal contractors. Diama-Shield uses specialized equipment and tooling to efficiently remove failing epoxies and unwanted floor coatings. Diama-Shield's coating removal arsenal includes scarrifiers, grinders, scrapers, screens, and diamond brushes, cup wheels, milling machines, shavers, planers and shot blasters. Extensive experience allows Diama-Shield to develop a work plan utilizing the most efficient equipment outfitted with the most productive tooling to tackle even the most complicated coating removal project. Creating a great looking floor often begins with removing an eyesore and prepping a surface as a prelude to a dramatic transformation. The old adage that 90% of a good paint job occurs during prep is true for installing high performance floor coating systems as well as producing high quality polished concrete floors. It is important to hire a contractor who understands the link between the unwanted floor and its next incarnation. Diama-Shield appreciates that coatings removal is an integral phase of successfully performing larger flooring coating or polishing projects. 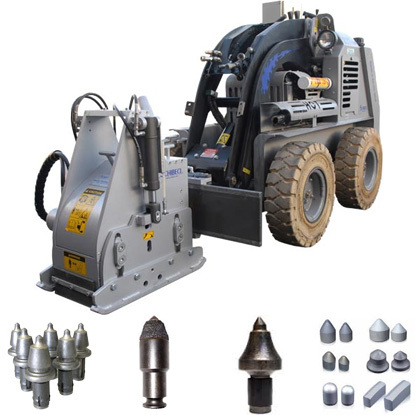 Diama-Shield has invested in heavy duty concrete removal equipment capable of milling, planing and leveling problem floors. Diama-Shield's Power Profiler is capable of removing from 5mm to 50mm of a concrete floor's surface. Power Profilers are typically outfitted with tungsten carbide cutting teeth which produce course surface textures. Milling is an efficient means of removing ceramic tile, prepping floors for re-tiling, profiling floors to receive epoxies and other resinous coatings and remediating contaminated surfaces. 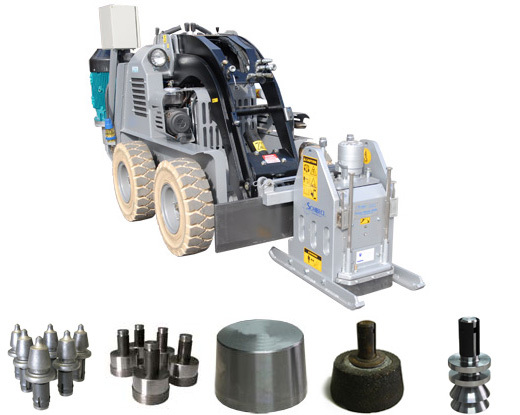 Diama-Shield's Power Planer is used for heavy duty planing and grinding applications when a smooth, level surface is desired. Power Planers are typically outfitted with carborundum tooling, tungsten carbide tooling and metal bond diamonds. 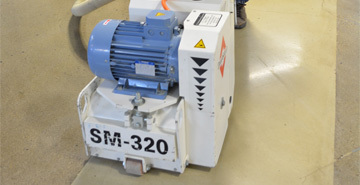 Power Planers can be set to fixed depths to create flat, level, consistent surfaces. Planers can also be called upon when deep, aggressive grinding is needed to produce exposed aggregate architectural design polished concrete floors.